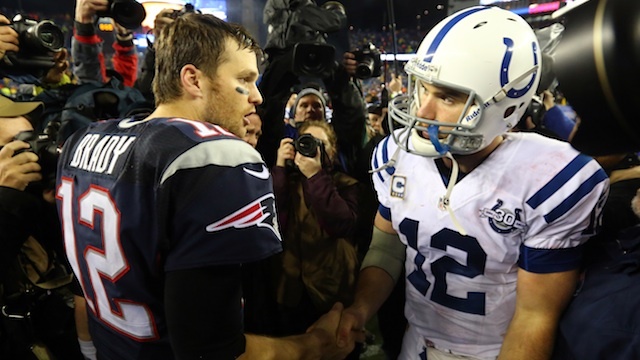 Will Tom Brady and Andrew Luck put up big numbers in a shootout this weekend? Four of the five top scoring teams in the NFL face off in Week #11 with a pair of shootouts a distinct possibility. The NFL’s top-scoring team, the Indianapolis Colts (32.2 pts./game) will take on the third most prolific scoring team this year in the NFL, New England (31.2 pts./game). In the NFC, the top two scoring teams in that conference, Philadelphia (31.0 pts./game) and Green Bay (30.8 pts./game) will square off in Green Bay. Will these games feature four big scoring offenses, or will the “D” have a rare impact? First, teams that have scored 30 or more points in a game this season are 72-5-2 (.924 winning percentage). Good news for high-scoring teams! Secondly, we have seen six games this season when both teams have scored 30 or more points in the game. One ended in a tie (Carolina-Cincinnati, 37-37) while the home team won four of the other five games. Good news for Green Bay and Indianapolis who host these two marquee matchups. Since 2000, there have been 197 regular season games played where both teams scored 30-plus points. Kansas City leads the league with 22 appearances in those games, followed by Dallas with 21 games. Jacksonville and Miami bring up the rear with only six games each played where both teams scored 30 or more points in a contest. Indianapolis (10-5 .667); New England (10-5 .667); Chicago (8-4 .667); Atlanta (10-5-1 .656); Arizona (5-3 .625); N.Y. Jets (5-3 .625). Pittsburgh (6-4-1 .591); Green Bay (10-7 .588); Denver (6-8 .571); Houston (4-3 .571); Baltimore (4-3 .571); San Francisco (4-3 .571); Carolina 4-3-1 .563); Tampa Bay (5-4 .556); St. Louis (7-6 .538); Cleveland (6-6 .500); Philadelphia (6-6 .500); Oakland (6-6 .500). Dallas (10-11 .476); Minnesota (7-8 .467); Cincinnati (6-7-1 .464); Washington (5-6 .455); New Orleans (8-11 .421); San Diego (5-7 .417); Kansas City (9-13 .409); Buffalo (6-9 .400); Detroit (6-9 .400); N.Y Giants (6-9 .400); Tennessee (4-6 .400). Note: The Atlanta Falcons have the longest active winning streak in games where both teams score 30-plus points; they have won four straight in such games. Buffalo and Seattle have the longest active losing streaks in such games; both teams have lost three straight when both teams 30-plus points.